First things first, what are your priorities? We all have different expectations and priorities when packing our makeup for travel. These could be things like the overall size of your travel makeup bag, or how your makeup is organized within the bag. 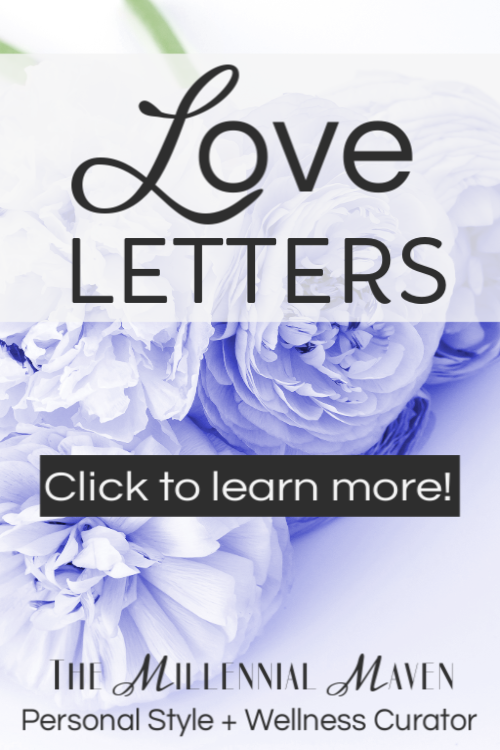 You can also prioritize things like making sure your most fragile products are safe, or place particular emphasis on packing only travel-sized products. The list is endless. 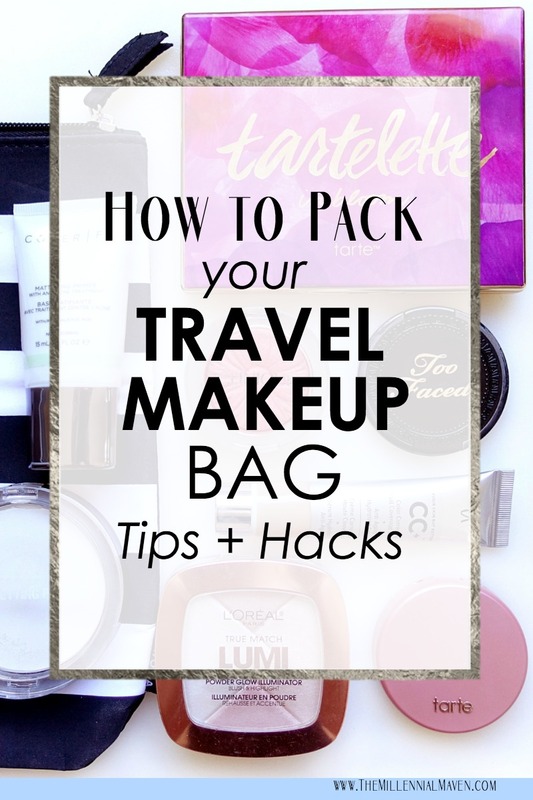 Think about what you want from your travel makeup bag and pack according to that. Remember, these are just my suggestions. Do what works for you! I alternate between these two depending on what kind of trip I’m taking. Sometimes I just want my luggage as little as possible, and so I’ll stuff everything I have into the smallest makeup bag possible. You’ll be amazed at what you can achieve if organization isn’t your concern. On trips when I know I will be taking pictures and I want to look a little nicer, I’ll give myself a little more room for makeup. That way I can pack a little more, in a more organized way. This second option is the one I’ll be showing you today. Because I’m sure you know how to shove things in a bag randomly, right? A good amount of makeup products come in liquid form, which means dealing with those ever-so-annoying “liquids rules” at airport security. Personally, I very rarely check a bag, so I am faced with those pesky rules every time. This system works with that perfectly. Just in case you need a refresher, here’s the gist of those “liquids rules” for carry on luggage. Checking a bag? Pack whatever liquids you want, this doesn’t apply. All liquids must be in containers not larger than 3.4 oz. or 100 mL. All of your little containers must fit inside ONE see-through quart sized bag. One bag per traveler. When it comes to traveling, what you pack is just as important as how you pack. Instead of scooping up all of your everyday products and calling it done, let’s try to travel-ify that collection of yours. This one is pretty obvious but if you can find anything that serves more than one purpose, it’ll make a great addition to your travel makeup bag. 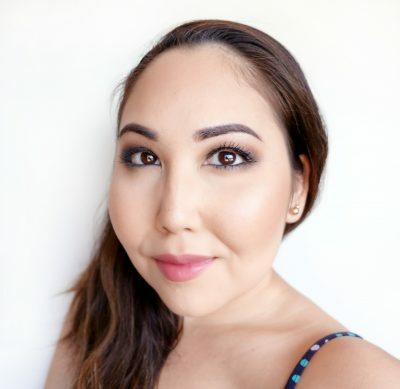 I’m talking blush/bronzer/contour/highlight palettes or duos, 2-in-1 brow products, double-ended lipsticks and eyeshadow sticks, and sheer-to-buildable foundations and concealers. Of course, pack things you like. Avoid packing something you don’t enjoy just because it’s multipurpose- you won’t use it and that makes it a waste of space. Even if you plan on checking a bag, liquids are just a pain. Containers break or mysteriously open, liquids spill, they go everywhere, it’s just not pretty. The biggest culprits here are obviously foundations in glass bottles, perfumes, nail polish, hair products, and toiletries. Remember, anything you want to pack must fit in your one little quart sized bag, so choose wisely. Not to worry, there exists plenty of great beauty options so traveling with minimal liquids shouldn’t be too much of an issue. You may believe yourself a bona fide expert on what is a liquid and what is not, but is all that really necessary? These days, I place my mascara, liquid lipsticks, liquid eyeliner, and Aquaphor in my travel makeup bag with my non-liquids. Basically anything that is less than about 0.3 oz. and comes in a straight tube. Anything larger goes in the separate clear liquids bag. The rules may be different in other parts of the world, (I’ve heard the UK is stricter when it comes to liquids,) but I’ve never had any issues placing my smaller items in my regular makeup bag. The kit pictured below has traveled with my on numerous occasions and I’ve never been stopped. This is my holy grail organizational system for makeup application on the go! I enjoy makeup, I really do. But when the clock is ticking on vacation, I want to minimize time spent getting ready as much as possible. The last thing I want is to be rummaging through my makeup bag looking for all of these little eye and lip products. I suggest purchasing a small, transparent organizer with two compartments. Use one side for small eye products such as eyeliner, mascara, brow products, concealer, and single eyeshadows. Use the other side for lip products. I just open the side for whichever feature I’m working on, and voila, all my products are at my fingertips! Larger products such as eyeshadow palettes and powders prove much easier to keep track of. I simply toss these into my travel makeup bag on top of my other organizational baggies. 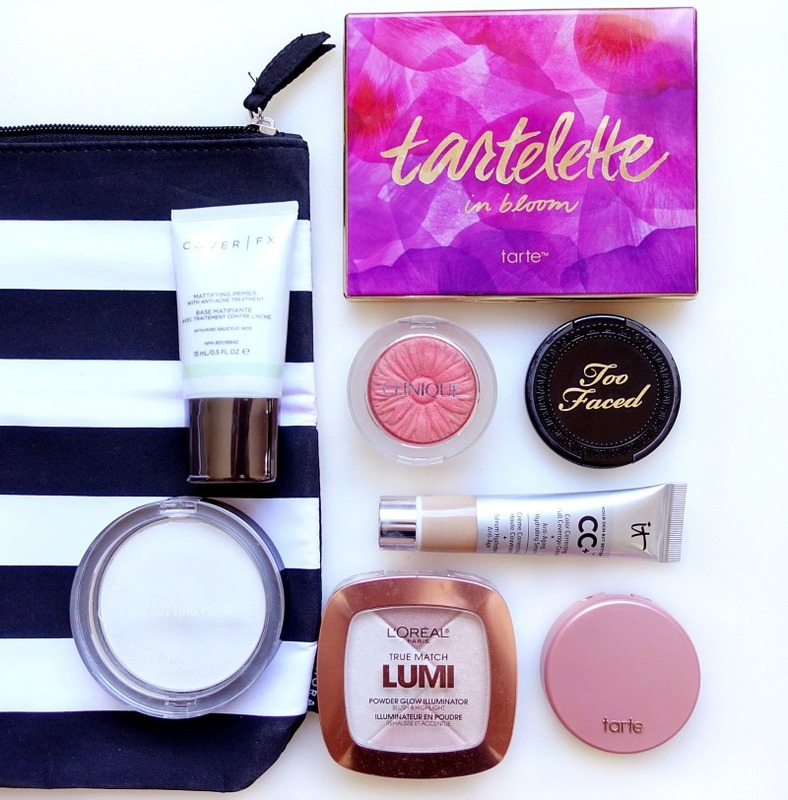 Don’t forget to separate your foundation, primer, and moisturizer into your liquids bag if you are going the carry-on route. Once I remove the other organizers when doing my makeup, my bag-o-face products feels spacious and not overwhelming. Being able to separate is key. Can you imagine what it would be like if everything was thrown into one compartment and my only options were to keep it all stuffed in there, or let everything roll free on the counter? I get anxious just thinking about it. Have a look at the kit I’ve been loving lately! Makeup brushes present two major packing problems. Firstly, how do you prevent your brushes from arriving at your destination all frayed and disheveled? Secondly, how do keep your travel makeup bag clean from all the product build up on the dirty brushes? The answer? The barrier method. 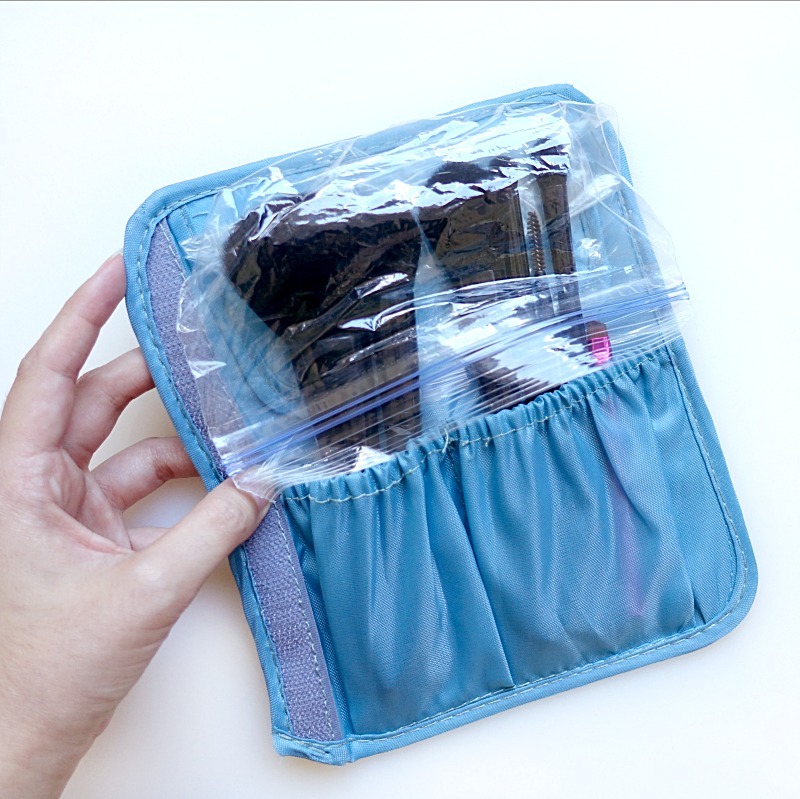 I travel with a surplus of Ziplock bags, and they come in handy for so many things. 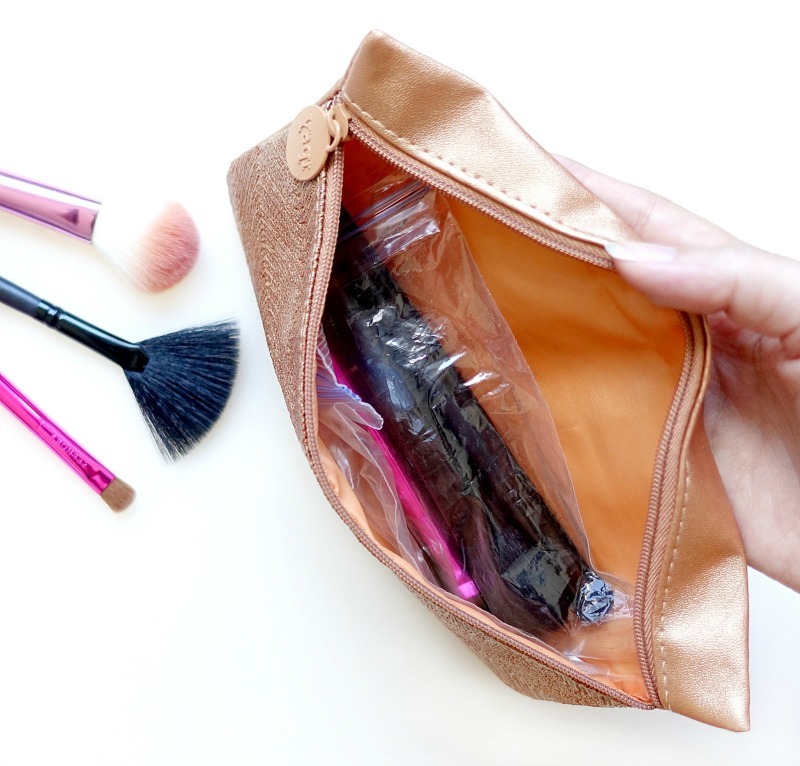 If you makeup bag features brush slots, simply slip the bag over your brushes and tuck the excess behind the brushes. No matter how crazily you slam shut your makeup bag, rest assured your brush hairs remain right where you want them. When the brushes are inevitably filthy on your way home, the plastic protects the inside of your makeup bag from all the grime. Because really, who has time for brush washing on vacation? If your travel makeup bag doesn’t feature brush slots, then I recommend grabbing a small pouch that fits inside your main bag. Here, I’m using an old Ipsy bag. Wrap the brush heads with a plastic bag the same way. With plenty of room to spare, might I add. Even this is my rather extreme makeup kit. I often pack much lighter than this, but this is what I bring when I want a reasonable amount of options for full glam looks. If you make the effort to choose multipurpose products, small and travel sized products, and just less item overall, packing all your makeup in a compact bag is totally doable. Give me a huge makeup bag, and I will fill it. 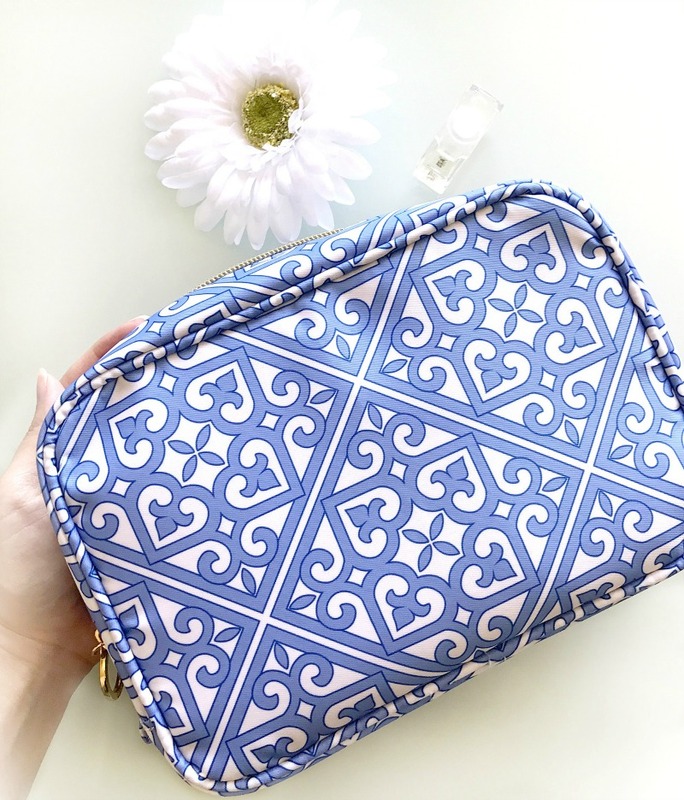 I’ve always wanted The Vacationer makeup bag from Sephora, but with that much space I’d end up hauling 8 pounds of makeup across the ocean, only to not want to apply it during the trip. Totally unnecessary. 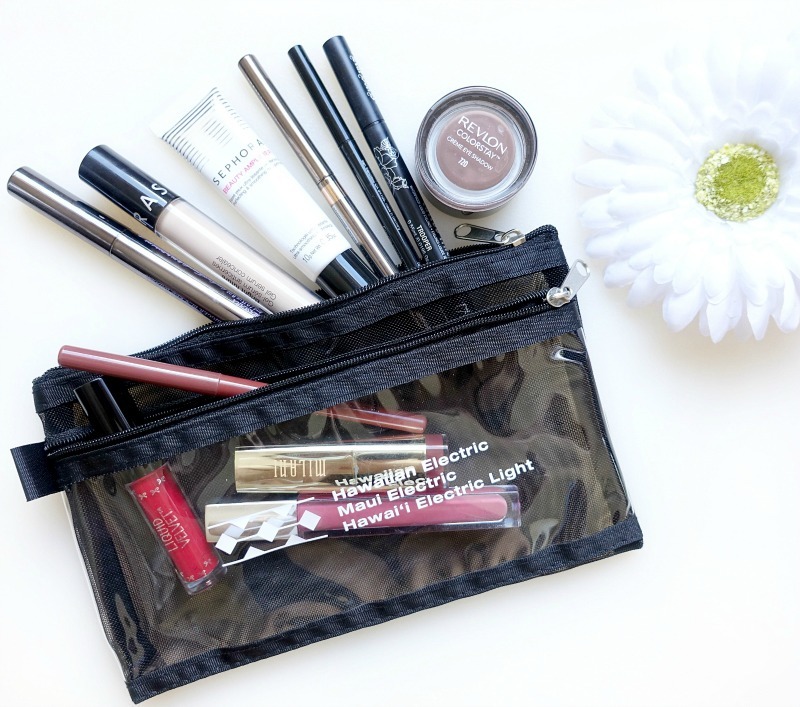 Try this- look for a travel makeup bag that you think holds everything you need for your trip. Then actually purchase a bag 25% to 50% smaller, but that has similar attributes. You won’t feel deprived because you settled for a hideous print or it doesn’t have the storage you want. Get packing, and you’ll be surprised at how much you can still fit in the bag, and how much of what you think you need isn’t essential at all. “Nesting” is basically when you intentionally unpack your things and set up your space away from home, rather than living out of your suitcase. If your makeup is all mixed up because you value space in your luggage, open up your bag and organize your items on the bathroom counter. Reintroduce your liquid foundation and primer into your general collection. 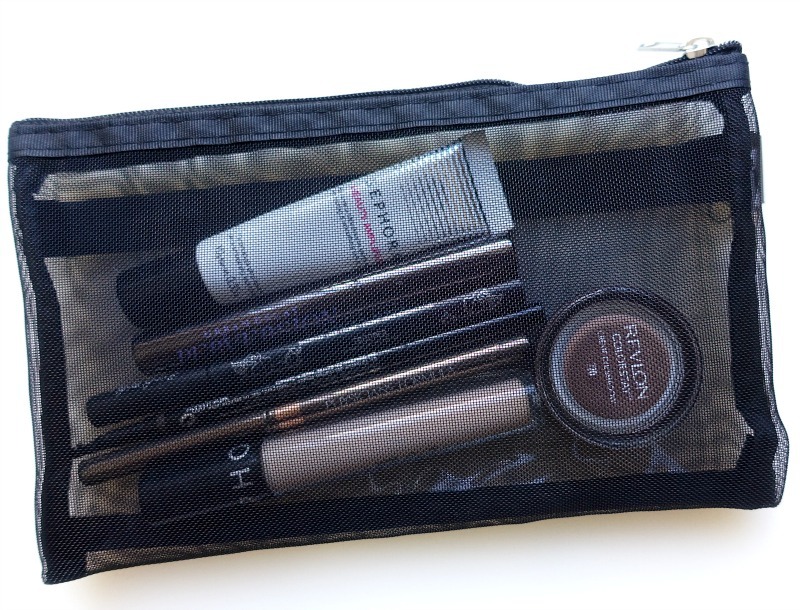 Even if your packed travel makeup bag isn’t perfect, you can still have a perfect experience at your destination.